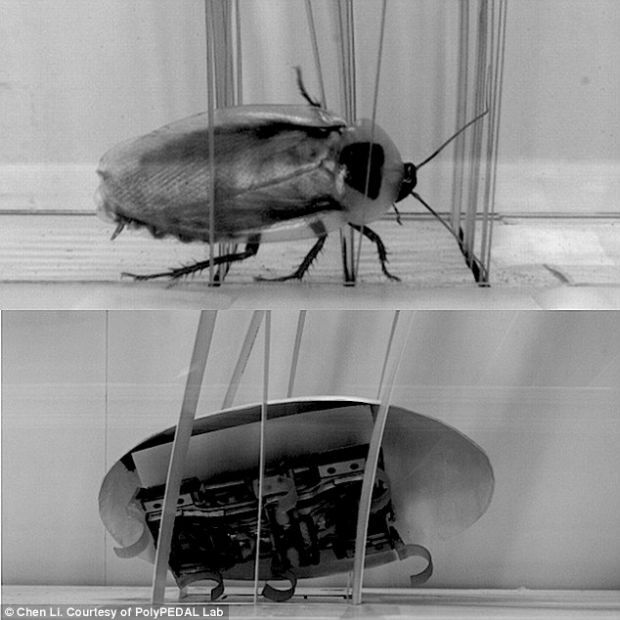 Researchers at University of California, Berkeley have designed a robot that is based on cockroach. Team envisions that the concept would inspire future robot designs so that the body shape might be used for tracking environment including exploration and rescue operations. Chen Li and his team designed the shell so that it can create a tilt maneuver than slipping through fissures between grass-like vertical beam hurdles without any assistance of sensors or motors. Although, there are various terrestrial robots fabricated so far but most of them have been programmed with ability to avoid obstacles than traversing them. The current bot resolves this issue as the tiny device makes its way across the hurdle, a mechanism that has been observed in cockroaches. In order to understand the traversing mechanism, the researchers observed Blaberus discoidalis or discoid cockroach under high-speed cameras. They introduced a course of artificial obstacle that resembled grass-like vertical beams into the way of insect and tried to emulate the same technique in their tiny, rectangular, six-legged device. They observed that the rectangular shape of the bot is causing hindrance when it comes to crossing over the grass-like beams consequent upon which, the robot would collide and at times even get wedged. Eventually, the team worked with a streamlined shell and noticed that the new fitting worked well while crossing through the hurdle course. The traversing movement or the roll maneuver resembled to that of cockroaches’. The change in behavior was the result of shell or body roundness in this case than the programming. Li further added that this insight has led them to shift their focus towards diversity of terrain and insect/animal shapes to find out more terradynamics so that new shapes could be morphed accordingly. The innovative approach will surely take terrestrial robots to the next level as it helps in filtering through cluttered environments with minimum use of sensors and simple controls.